The most common dental problem in the country is tooth decay, often referred to as a cavity. In fact, according to the U.S. Surgeon General, about 78 percent of people have had at least one cavity by the age of 17! Thankfully, there’s a terrific treatment for this dental problem – fillings. As your Maplewood, MN dentistry providers, we at Maplewood Dental Associates are glad to provide this service. 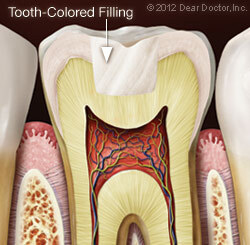 Fillings are used to seal a small hole in your tooth, which is typically caused by decay. A filling will prevent the decay from spreading further into your tooth and causing damage to your sensitive inner pulp tissue that’s in the root canal. First, your Maplewood, MN dentist will perform a clinical exam of the tooth and determine the extent of its decay. To make sure that you won’t feel any discomfort, we’ll numb the area of the tooth decay with local anesthesia. We’ll then remove the decayed area of the tooth using a dental drill and make sure that all debris is cleaned from the tooth. We’ll seal the tooth with one of our many filling materials to rebuild the tooth’s structure. 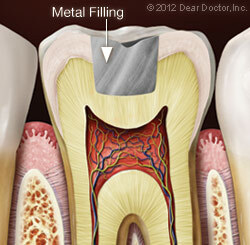 Fillings can be divided up into two different categories: metal fillings and tooth-colored fillings. No one type of filling is the best in every situation and we’ll be glad to discuss the details of each one. Amalgam — This is the classic silver filling that’s been used for over a century. Dental amalgam is actually an alloy that’s made of silver, mercury, tin, and copper. The mercury combines with the other metals included in the amalgam to make it safe and stable. These fillings are strong and inexpensive, but they’re highly noticeable and also often seen as the least aesthetically-pleasing of the fillings. Cast Gold — This is one of the most expensive restorative dental materials. It combines gold with other metals to create a very strong and long-lasting filling. Like amalgam fillings, cast gold fillings are highly noticeable, though many people prefer that about these fillings. Composite — This is an excellent choice for those who don’t want people to be able to see that they have fillings. Composite is a mixture of plastic and glass, which bonds to the rest of the tooth. These are more expensive than amalgam fillings, though they provide a more aesthetically-pleasing look and they’ll hold up about as long as well. Less drilling of the tooth is needed when placing a composite filling as opposed to amalgam. Porcelain — These high-tech dental ceramics are strong, lifelike, and they won’t stain, unlike composites. They’re often more expensive because they can require the use of either a dental lab or specialized computer-generated technology. While these are considered to be the most attractive type of filling, they can also be brittle, due to their relatively-high glass content. Glass Ionomer — This type of filling is made of acrylic and glass powders. Glass ionomer blends in well with a person’s natural tooth color and will even release small amounts of fluoride to help prevent decay. However, they won’t last as long as other restorative options. The numbness from the anesthesia should wear off within a few hours. Until then, we recommend not eating on the side of your mouth with the filling and avoiding hot or cold liquids. You may have some sensitivity to hot and cold for the first few weeks after getting a filling, though if it persists longer than that, please get in touch with us and let us know. You’ll also want to keep up with your normal brushing and flossing; teeth with fillings require the same oral hygiene that the rest of your teeth do. If you have any questions about our fillings or any of our other dentistry services, please don’t hesitate to contact us. If you’d like to schedule an appointment with your Maplewood, MN dentist, we encourage you to fill out our appointment request form. We’re looking forward to helping you attain a healthier smile!